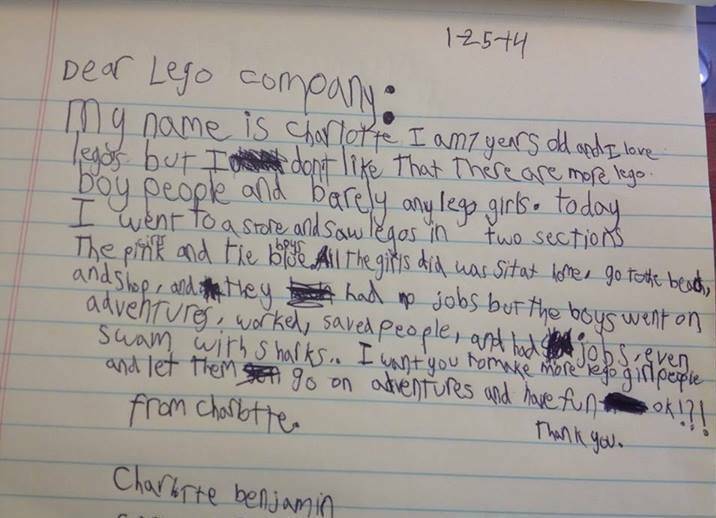 A proud father shared with us a letter written by his daughter, 7 year old Charlotte, to the LEGO company. 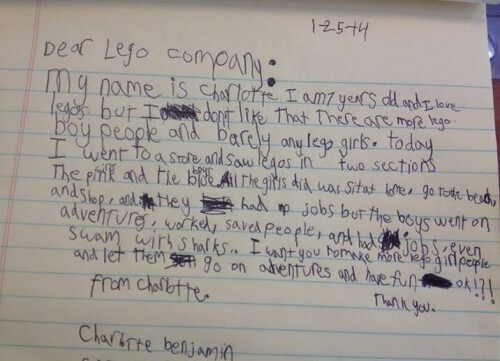 She asked for for more female minifigs and more adventure for girls. We put the letter out on social media this week and it’s been re-tweeted over 1,000 times and shared over 3,000 times on Facebook. 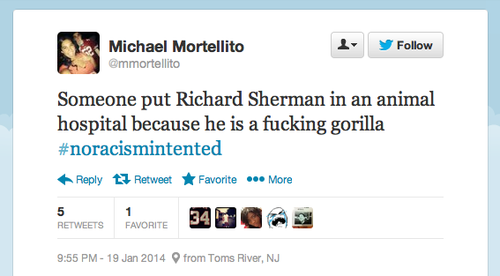 This is how social media can be used to put pressure on companies to change. Huzzah! Well done Charlotte and big thanks to Dad! Pssssst. 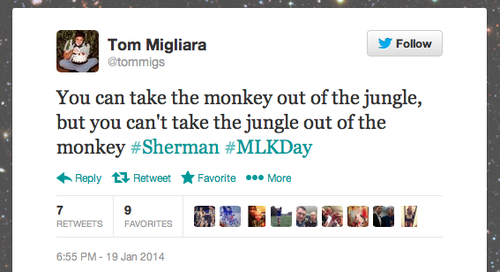 Martin Luther King, Jr. was a sociology major. This is your monthly reminder that SocImages is on Twitter, Facebook,Tumblr, Google+, and Pinterest. I’m on Facebook and most of the team is on Twitter: @lisawade, @gwensharpnv, @familyunequal, and @jaylivingston. Stay warm New Orleans! I’m arriving on Monday and I expect you to be hospitable! If you’re in the city, I’d love to get together! 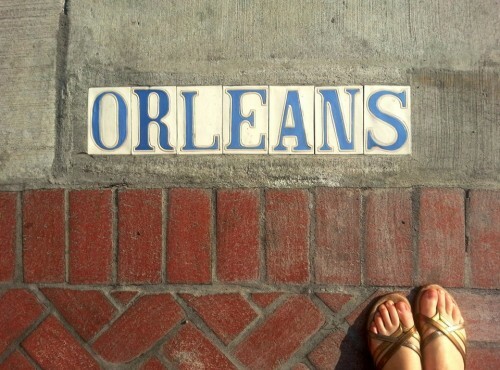 I’ll be there through Mardi Gras. Send an email to socimages@thesocietypages.org and I’ll be in touch! One conventional explanation for our economic problems seems to be that our businesses are strapped for funds. Greater business earnings, it is said, will translate into needed investment, employment, consumption and, finally, sustained economic recovery. Thus, the preferred policy response: provide business with greater regulatory freedom and relief from high taxes and wages. It is this view that underpins current business and government support for new corporate tax cuts and trade agreements designed to reduce government regulation of business activity, attacks on unions, and opposition to extending unemployment benefits and increasing the minimum wage. One problem with this story is that businesses are already swimming in money and they haven’t shown the slightest inclination to use their funds for investment or employment. 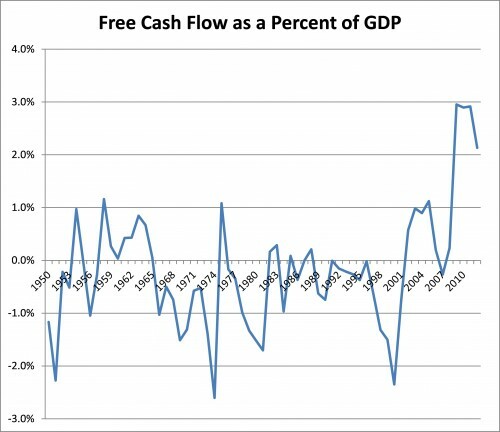 The first chart below highlights the trend in free cash flow as a percentage of GDP. 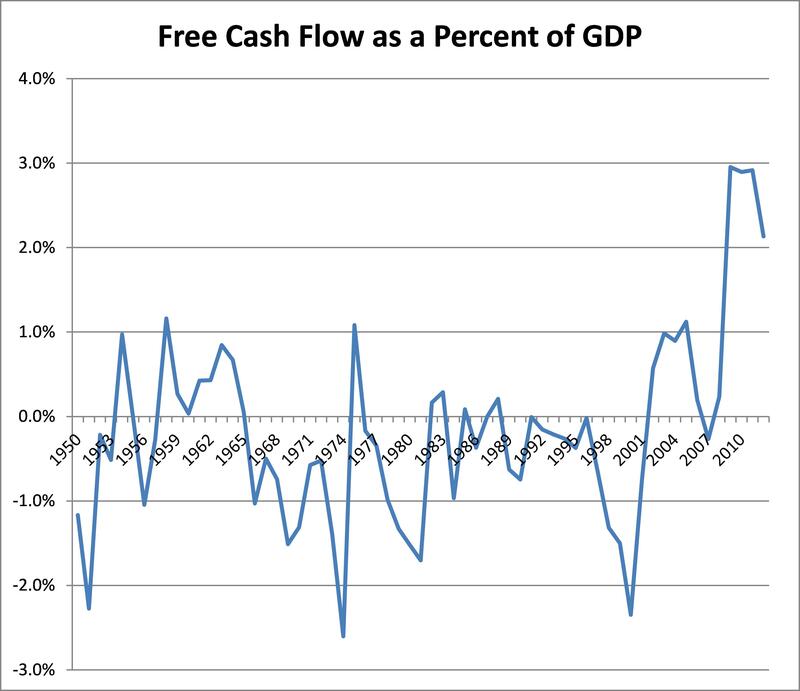 Free cash flow is one way to represent business profits. More specifically, it is a pretax measure of the money firms have after spending on wages and salaries, depreciation charges, amortization of past loans, and new investment. 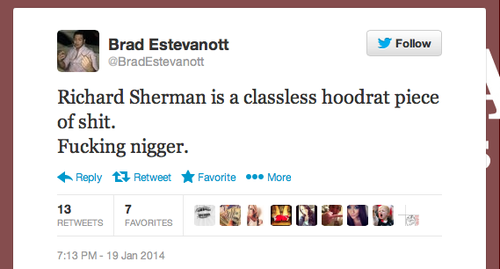 As you can see that ratio remains at historic highs. In short, business is certainly not short of money. So what are businesses doing with their funds? 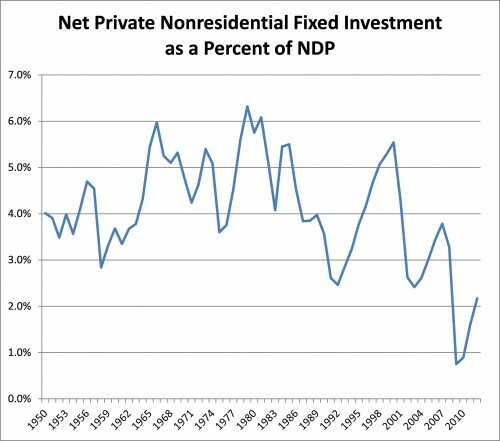 The next chart looks at the ratio of net private nonresidential fixed investment to net domestic product (I use “net” rather than “gross” variables in order to focus on investment that goes beyond simply replacing worn out plant and equipment). 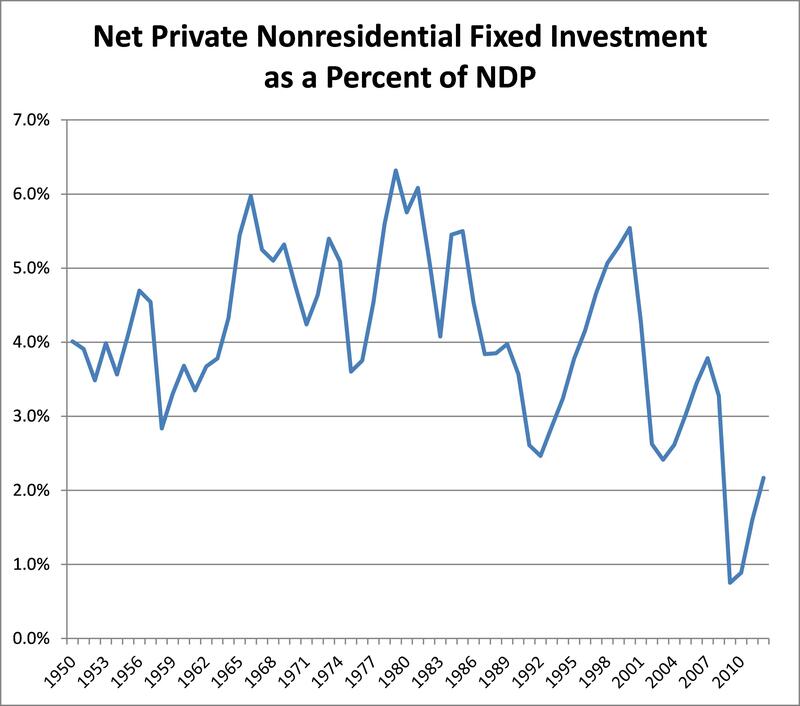 The ratio makes clear that one reason for the large cash flow is that businesses are not committed to new investment. Indeed quite the opposite is true. Rather than invest in plant and equipment, businesses are primarily using their funds to repurchase their own stocks in order to boost management earnings and ward off hostile take-overs, pay dividends to stockholders, and accumulate large cash and bond holdings. Cutting taxes, deregulation, attacking unions and slashing social programs will only intensify these very trends. Time for a new understanding of our problems and a very new response to them. We have an ever-growing collection of ways in which men are frequently positioned as people and women as women. We’re always on the lookout for new examples and sociologist Nathan Palmer recently highlighted a nice observation about how this happens in language. 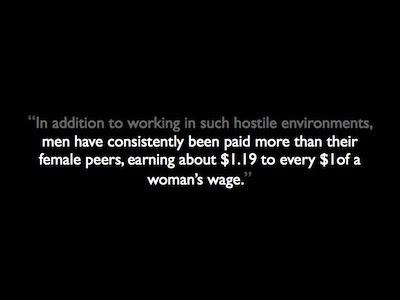 If a dollar is the amount by which all other wages should be compared, then the first sentence centers men’s experiences and positions women as a deviation from that. The second sentence switches that around. By switching the referent, this change in language shifts the center of the discussion from women’s disadvantage to men’s advantage. Of course, there is both unfair disadvantage and advantage in this story, and we need to make both visible, but always talking in terms of the former makes women and their disadvantage the problem and hides the way that we need to be addressing men’s unfair advantage as well. 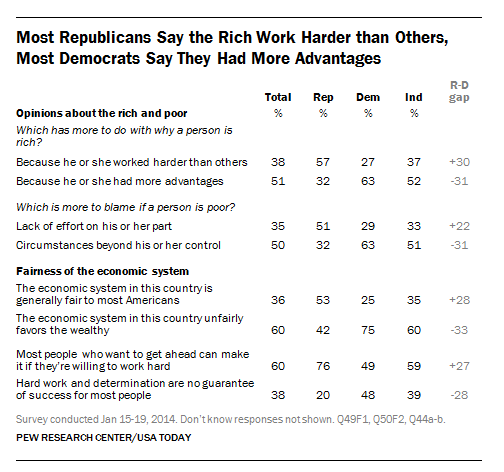 A majority of both Democrats and Republicans believe that economic inequality in the U.S. has grown, but they disagree as to its causes and the best solutions, according to a new survey from the Pew Research Center. 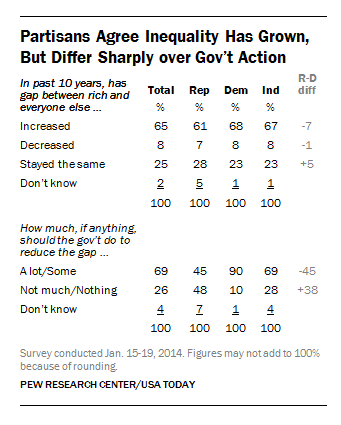 While 61% of Republicans and 68% of Democrats say inequality has widened, only 45% of Republicans say that the government should do something about it, compared to 90% of Democrats. A study using the General Social Survey has confirmed the findings. 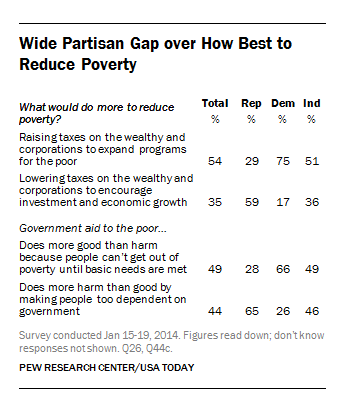 Republicans and Democrats also disagree about what the best interventions would be. 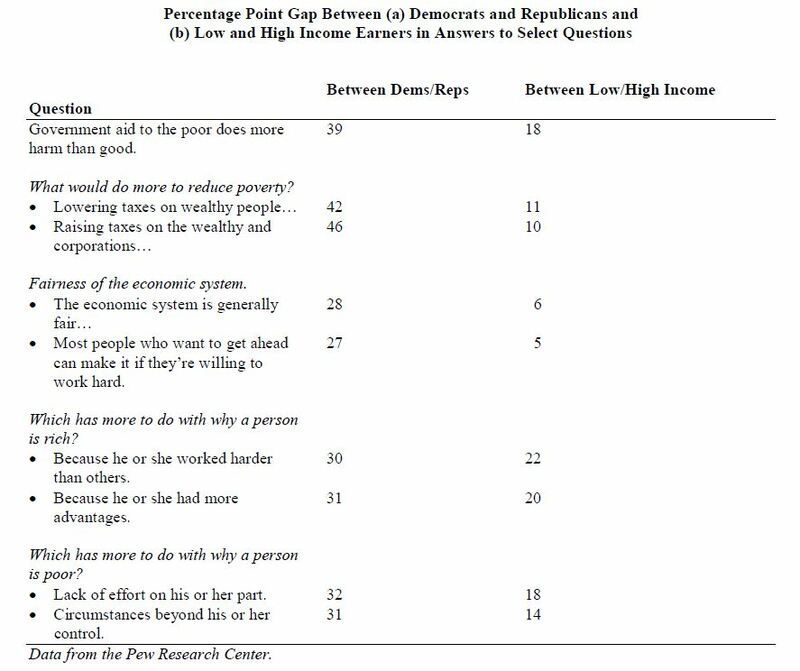 At least three-quarters of Democrats favor taxes on the wealthy and programs for the poor, but 65% of Republicans think that helping the poor does more harm than good. The differences may be related to beliefs about the cause of poverty. Republicans are much more likely to endorse an individualist explanation (e.g., people are poor because they are lazy), whereas Democrats are more likely to offer a structural explanation (e.g., it matters where in the class structure you begin and how we design the economic system). 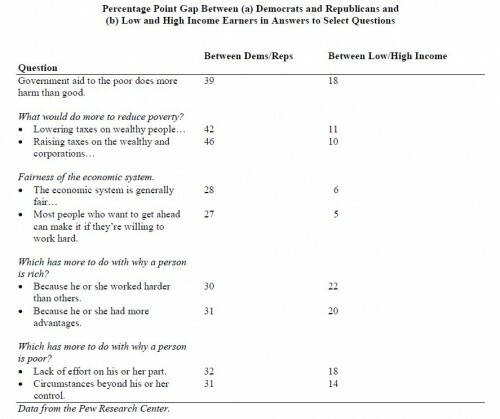 Interestingly, answers to these questions vary much more by political affiliation than social class. Using data from the survey, I put together this table comparing the number of percentage points that separated the average answers to various questions. On the left is the difference by political party and, on the right, income (click to enlarge). Clearly political affiliation drives opinions on the explanation for and right solutions to income inequality more so than income itself. 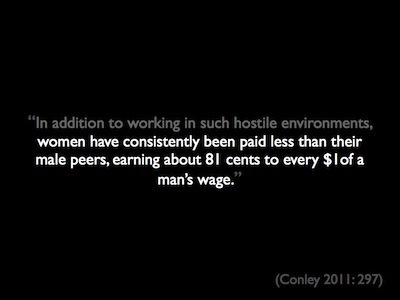 This is a great example of hegemony. A hegemonic ideology is one that is widely supported, even by people who are clearly disadvantaged by it. In this case, whatever you think of our economic system, it is pretty stunning that only there is only a six point gap between the percent of high income people saying it’s fair and the percent of low income people saying so. That’s the power of ideology — in this case, political affiliation — to shape our view of the world, even going so far as to influence people to believe in and perhaps vote for policies that are not in their best interest. Sociologist Sangyoub Park forwarded us a fascinating account of Ikea’s business model… for China. In the U.S., there are rather strict rules about what one can do in a retail store. Primarily, one is supposed to shop, shop the whole time, and leave once one’s done shopping. Special parts of the store might be designated for other activities, like eating or entertaining kids, but the main floors are activity-restricted. Not in China. Ikea has become a popular place to hang out. People go there to read their morning newspaper, socialize with friends, snuggle with a loved one, or take a nap. Older adults have turned it into a haunt for singles looking for love. Some even see it as a great place for a wedding. 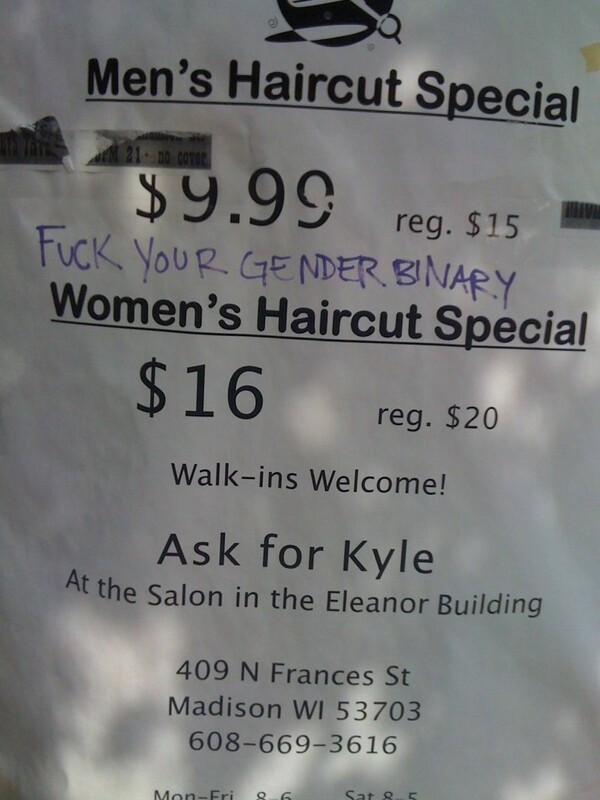 This is a great example of the social construction of spaces: what seems like appropriate behavior in a context is a matter of cultural agreement. In the U.S., we’ve accepted the idea that the chairs in our local furniture store are not for socializing. Some of us, depending on our privilege, could probably get ourselves arrested if we took a nap at our local Mattress King. But this isn’t an inevitable truth. If we all just collectively change our minds, the people with power included, then things could be different. A new submission inspires me to re-post this great collection of public resistance to advertisements that objectify women. Adding commentary to the ubiquitous images that surround us can help us to notice, even if just temporarily, that our environment is toxic to our ability to think of all people as full and complete humans. Here are some inspiring examples. 1. An unknown artist pastes the photoshop toolbar on H&M posters in Germany (thanks Dmitriy T.C. and Alison M.). 3. Commentary on a Special K. ad in Dublin, sent in by Tara C. (Broadsheet). So I can be slim just like you. 5. Tricia V. sent us an example of this kind of resistance in Haiti. The billboard below is in for a brand of beer called Prestige. Tricia writes: “The writing [along the bottom of] the billboard says “Ko O+ pa machandiz” which translates as ‘Women’s bodies are not merchandise. '” She was impressed at the effort exerted to climb up and write across a full-sized billboard. 7. 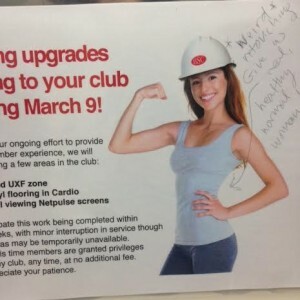 Sasha Albert saw this comment written on a “please excuse our construction” sign at her gym. Someone else had already written: “WEIRD retouching. Give us a real, healthy, normal woman!” Read more at About Face. See also: my mom has a phd in math. For a classic example, see “If it were a lady, it’d get its bottom pinched.” For an example of backlash to public anti-sexist messages, see this post on defending privilege (trigger warning). Cross-posted at Ms. Sources: here, here, and here. The Pew Research Center has released the data from new survey of religious and non-religious Jews. They find that almost a quarter of Jews (22%) describe themselves as being “atheist,” “agnostic,” or “nothing in particular.” The percentage of Jews of no religion correlates with age, such that younger generations are much more likely to be unaffiliated. Nearly a third of Millennials with Jewish ancestry say they have no religion (32%), compared to 19% of Boomers and 7% of the Greatest Generation. A majority of Jews with no religion marry non-Jews (79%); 67% have decided against raising their children with the religion. As a result of intermarriage, the percent of all Jews who have only one Jewish parent is rising. While 92% of people born between 1914 and 1927 had two Jewish parents, Millennials are as likely as not to have just had one.